How Does VideoProc Assist in Solving iPhone Video Problems? •	It converts iPhone videos @4K 60fps to playable formats & settings for Mac/PC, Android, Instagram, HDTV, etc. •	It encodes videos (HEVC, MKV, MTS, etc) from DSLR/DJI/GoPro/DVD/Website to MP4 or MOV for iPhone. •	It adjusts FPS, file size, resolution, aspect ratio, codec (e.g. HEVC to h.264), etc. •	It seamlessly edits, cuts, crops, merges, records, splits, stabilizes, slows down/speeds up iPhone videos and more. •	Its level-3 HW Acceleration ensures No.1 fast speed and fixes CPU overloading issue in 4K conversion. Chance to win yourself a License of VideoProc for FREE in the VideoProc giveaway! The iPhone XS Max sweepstakes lasts from January 11, 2019, to February 20, 2019. 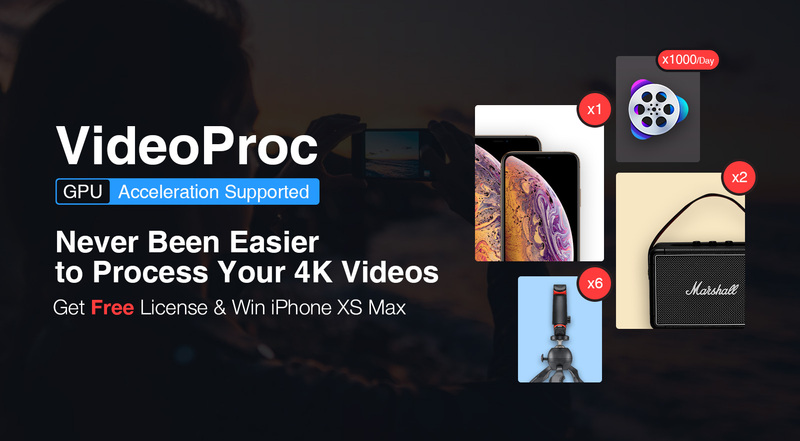 •	Enter a valid email address to earn one entry of the iPhone XS Max sweepstakes and receive the VideoProc license key. •	Share the contest page, download VideoProc, follow VideoProc social media accounts and visit VideoProc official site to win more entries. More ENTRIES, more CHANCES of WINNING the prizes!! Hurry!! Take part in the campaign and Free get VideoProc and win iPhone XS Max. How VideoProc Converts iPhone Videos? VideoProc is a versatile 4K video processing tool, powered by GPU acceleration, which assists users to convert video and audio formats easily with no quality loss, and offers convenient video edit, compression, download, and record features. How to Convert iPhone HEVC to H.264? Launch VideoProc and press ‘Video’ button on the main interface. After that, click on ‘+Video’ icon to import the HEVC videos taken by your iPhone from computer. OR drag the source video files into the software from computer. Choose ‘H.264 MP4’ as the output video format in the Target Format column. Click ‘Browse’ to specify an output folder to save the output video. Tick ‘Nvidia/Intel/AMD Hardware Acceleration Engine’, and hit ‘RUN’ to start converting (iPhone) HEVC to H.264 (MP4) to make it compatible with all video players and editors. •	converts iPhone video parameters such as frame rate, bit rate, and resolution to let the videos play smoothly on 3rd party video players (e.g. it converts 4K 60PFS video to 30FPS) or reduces file size. •	converts iPhone video to GIF. VideoProc also converts video/audio for iPhone playback. Open VideoProc and hit ‘Video’ on the main UI. Click ‘+Video’ button to load the video that won't play on iPhone. You can also load multiple videos at a time. Choose a perfect output file format for iPhone. Hit ‘RUN’ button to begin the conversion. •	Converts MKV, FLV, AVI, etc to MP4, MOV for successful playback on iPhone. •	Converts music to AAC, MP3, AIFF, M4A, etc. for playback on iPhone. •	Converts camera, drone, GoPro videos to iPhone compatible format and parameters at one click. •	Converts music to iPhone ringtone. •	Converts 3D video resources to 2D for iPhone playback. •	VideoProc has a unique Level-3 hardware acceleration tech which offers up to 47x faster video processing speed, lossless video quality, and hugely lowers CPU usage to 40%. •	The tool supports the conversion of large 4K UHD videos very smoothly. •	It has up to 420 device-specific profiles and can convert any video to all models of iPhone, iPad, Android, YouTube, Facebook, Instagram, etc. without complex settings manually. •	It has an intuitive interface and easy operations. The software allows the finishing of iPhone video conversion in a single click. •	It downloads videos from YouTube and 1000+ sites. •	It seamlessly edits, cuts, crops, merges videos, adds filters and subtitles on the videos. •	It records computer and iPhone screen without the annoying red bar. •	It converts all types of DVD to video for iPhone playback. Apart from converting iPhone videos, VideoProc converts videos for Android, camera, GoPro, drone, YouTube, etc. also. Hurry!! Don’t waste another minute, and take part in the giveaway and get a chance to win VideoProc License for free.